Analog Man carries the Boss TU-3 Chromatic Tuner. 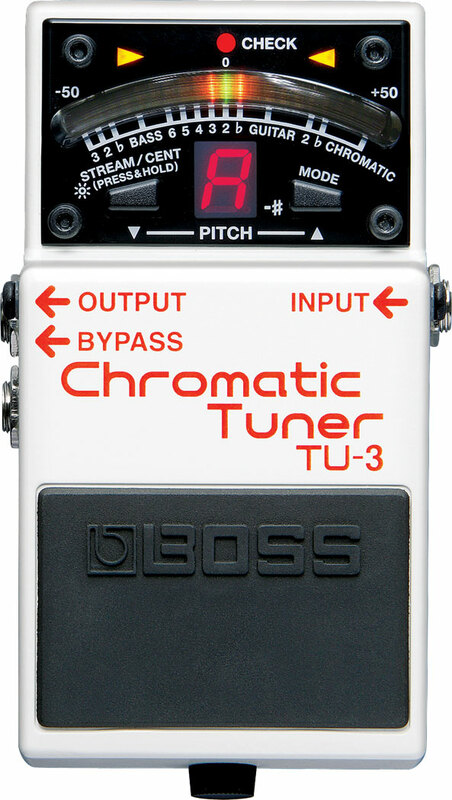 Boss TU-3 chromatic tuner, silent tuning with LEDs, this is one of the best tuners we have found. A must have for your pedal board. When it's not ON, it does not use much power, about as much as an analog pedal. When ON and you are tuning, it does boot up the computer chip so it uses a lot of battery but if you don't tune for more than a few minutes a night, a battery will last pretty long. The bypassed tone is quite good, but if you want true bypass, check into the Strobostomp tuner or KORG Pitchblack which we also sell.